Sometimes, being known as a "foodie", "food person" and/or "food connoisseur" does have its disadvantages. Other than the possible weight gain, possible health problems and dwindling savings, there is "judgement". Ah yes, the "why the heck would you eat/or visit THAT place???". C'mon, one can enjoy food without being a food snob right? So when I'm on vacation, I'm going to unapologetically visit touristy places because I want to. Therefore, when we were in Boston's North End, we did exactly that and followed the lemmings into Mike's Pastry. When at Mike's Pastry, one must get the Lobster Tail aka La Sfogliatella in Italy. 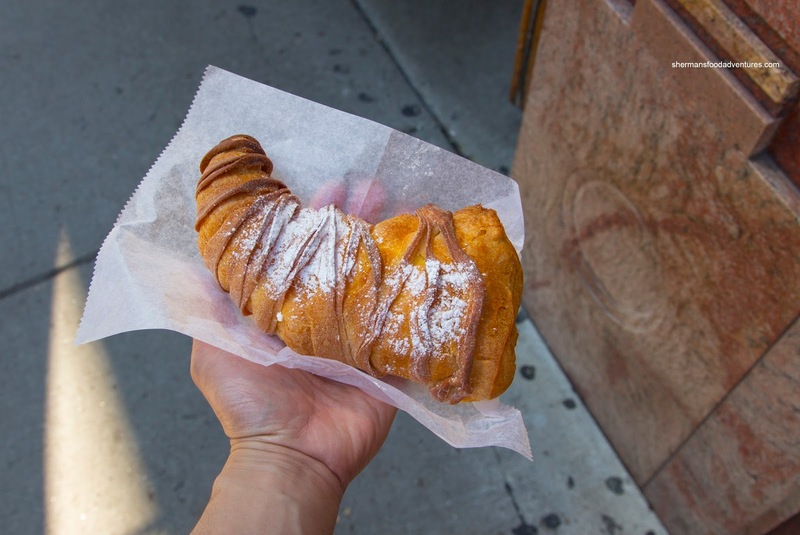 To be clear, the lobster tail pastry is unique to the States as the one in Italy is smaller and not necessarily filled with cream. As much as I've been told that Modern Pastry has a better version, I just had to have the most well-known one. So how was it? Well, the thing was really large and filled to the brim with sweet fresh white cream. I found the pastry itself more dense that I would've expected with only some layers being crisp. It was still good, but after a few bites, I had to pass it off as it was too much for one person. Well, we can't have one item and call it a day right? So we let the kiddies choose a few more goodies. 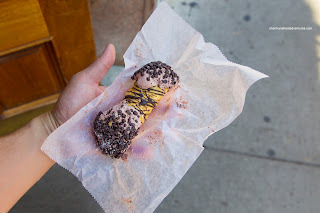 My son made a real good choice with the Chocolate Chip Ricotta Cannoli. We thought this was much more memorable than the lobster tail as the cannoli itself was crisp and fairly light. 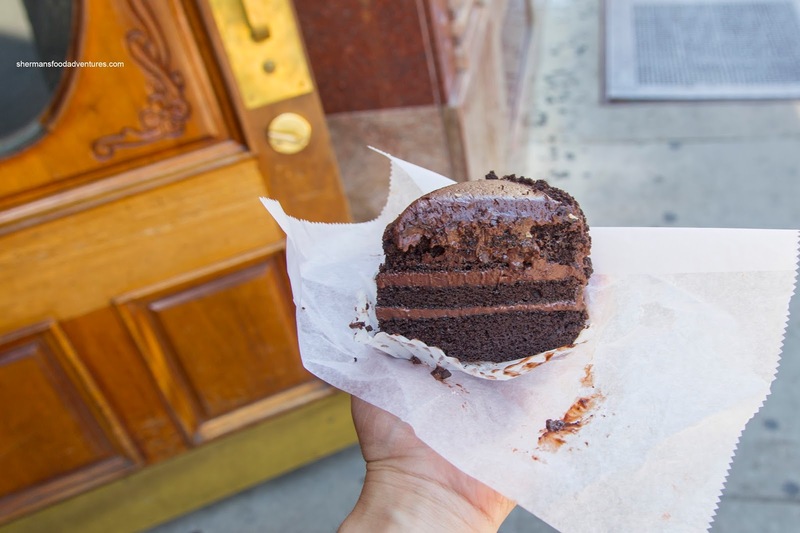 The creamy ricotta filling was lightly chocolatey and only semi-sweet. There was so much of it, it was overflowing out the two ends. The chocolate chips added a nice crunch as well as more flavour and sweetness. My daughter insisted on the Chocolate Fudge Cake which looked really heavy. However, it ate much lighter than it appeared. The cake portion was fluffy and only semi-sweet, hence we could taste the chocolate. The icing portion was naturally sweeter, but not as much as one would think. I hate things that are too sweet, so this actually worked for me. Even with this small sample size, it was pretty clear to me that the lobster tail is indeed a tourist trap in itself. At least I got to try it! The other 2 items were actually quite good! 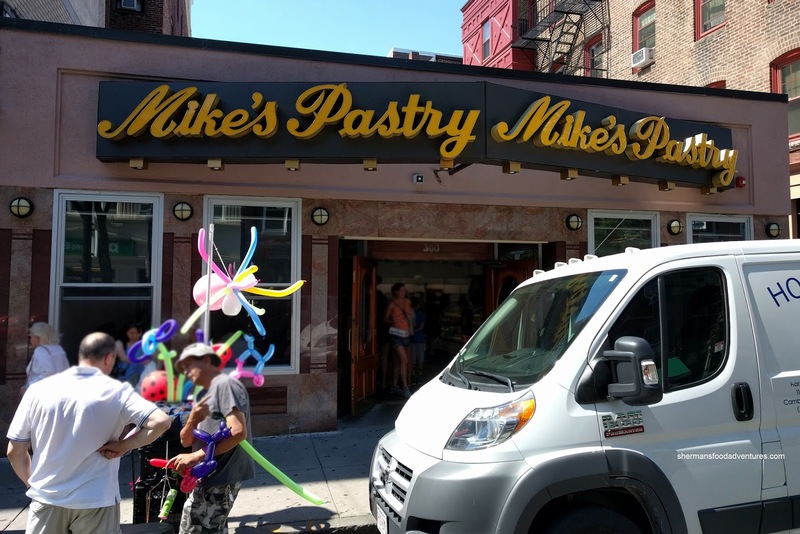 We didn't have the lobster tails at Mike's but we definitely enjoyed the cannoli, the best we've had in our limited experience.